In March of 2006 I fell in love with a dessert named Vienesse Hot Chocolate Soufflé. 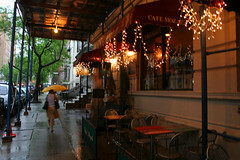 It happened when I went out to celebrate a friend’s birthday at Café Mozart on the Upper West Side. There were five of us altogether, the only one I knew previously was the birthday girl Colette, who just happens to design custom wedding dresses for a living. You know the show Project Runway? Well that was her, she wasn't on the show, but went to school at Parsons under the direction of Tim Gunn himself. But that is a story for another day. I’d never been to Café Mozart before, so I arrived a couple minutes early just to make sure I wasn’t late. Walking times vary in the City, and are wholly dependant on choice of footwear, state of (non/)exhaustion, and how trying one’s workday was. We planned to meet at 9:30 and darkness had long since fallen. It was a fairly nice night for winter, not frigid and windy. Being semi-new to the City at that point, I set out from my apartment, bundled up in a winter coat, and booked it down Amsterdam toward 70th Street. The lure of “super yummy deserts” and a chance to wish my friend well drew me on. I slowed my pace then nonchalantly rounded the corner of Broadway and 70th, and swept my gaze along the street. Anxious not to look out of place, I strolled down the street and scanned the signs without looking like a rubber-necker. My relief was palatable when I spied my destination without fuss. Now, all I had to do was linger outside by myself, while I waited for everyone else to show up. Another girl arrived at the same time I did, she joined me in trying to look normal while waiting by herself just a few steps away. Turns out we were both in the same party. We had a good laugh about that. One of us ordered dinner, a chicken cesar salad that looked delicious. I can’t remember what anyone else ordered since I was too enamored of my new find. It was hot gooey melt in your mouth goodness. 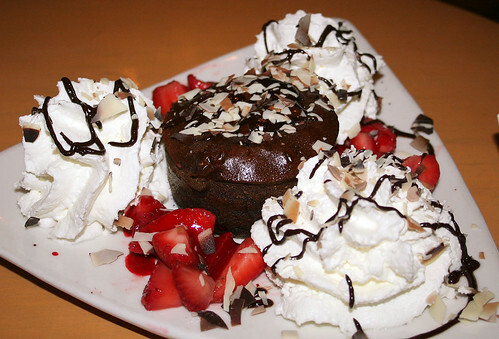 Vienesse Hot Chocolate Souffle: Warm chocolate soufflé cake, fresh strawberries and whipped cream. Café Mozart is one of those places where you can just sit back and relax. Chat with your friends, or admire the view by yourself. No, they don’t really have a view. However, they do have a nice stack of papers you can read from. The servers are friendly and are the type that don’t rush you. (At least they are that way when I’ve gone during off hours.) They remind me of the time I ate at a Chinese Restaurant just off the Champs Elysees. But that’s also a story for another day. Let’s just say, they’re quite content to let you sit and chat to your hearts content. It’s a perfect place to enjoy a nice dinner out, or dessert after catching a concert at Lincoln Center. And now back to our night out for a quick wrap-up, because I know you’re dying to know how they celebrate birthdays. Well it’s grand. There we were chatting and enjoying our time, when I noticed that the music had changed to a tympani led drum-roll which heralded an orchestral version of Happy Birthday. The servers came out with a goodie bag, made Colette wear a tall Mozart-type wig, and snapped her photo. I think another dessert was involved, but can't remember. It was quite an event, and was great fun. Have I celebrated a birthday there since March 2006? No. Do I know if they have changed and celebrate them differently now? No. Should I go anyway and celebrate my birthday there? Absolutely. And that dear readers is how I came about finding and then falling in love with the Vienese Hot Chocolate Soufle at Café Mozart. Edit 10/5/08: I discovered on Sept. 27, 2008, that this restaurant is closed. Sad day. WOW! That is one amazing dessert! I may have to try my hand at making that, because I don't think that any restaurants in this area make anything even close. 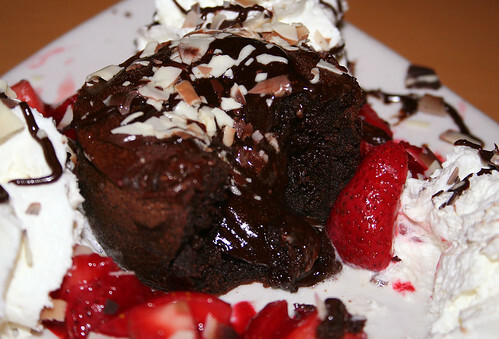 If I ever find a fabulous recipe for a molten chocolate soufle, I'll let you know. *grin*, no just at a restaurant here in the City.